The Christmas season is here and with it comes all the planning, shopping, wrapping, baking and not to mention holiday parties. We crafters love to make gifts, decorations and home decor to express our creativity, but sometimes it can be overwhelming. These free printables can help crafters make holiday crafts with a tiny bit of aid, making it a "win, win" for those of us that want to add a handmade touch to Christmas but just have too much to do. The first free download is tabloid sized printable Christmas wrapping paper. 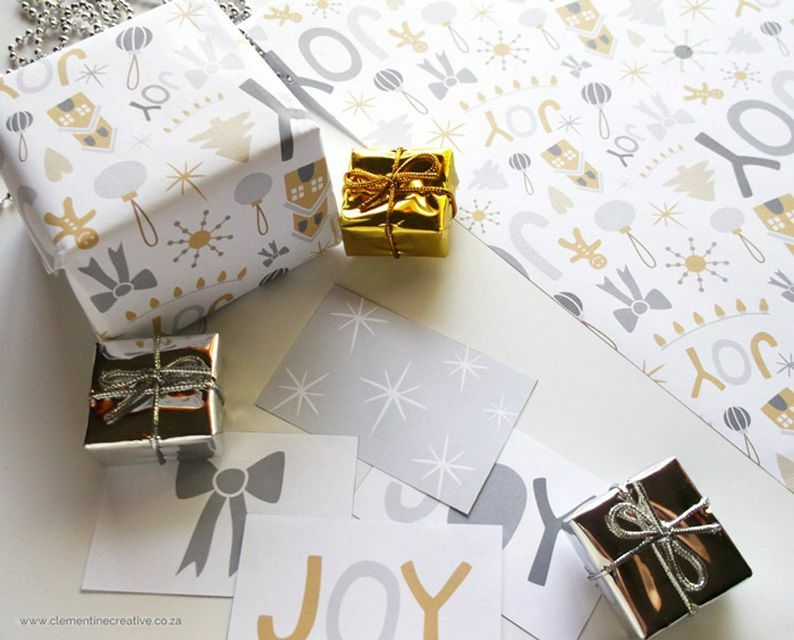 The paper is a trendy gray and gold color featuring Christmas symbols. It is stunning and will add an elegant look to your presents. This paper is perfect for smaller sized gifts. Christmas preparations can stress out even those people that have been blessed with the "organization" gene. For those of us that are perpetually challenged trying to stay organized, (myself included) the free Christmas list printables can be a godsend. Becomingmartha.com offers printable lists that cover the following: Christmas contacts and addresses, Christmas Gift List, Holiday party planner, project to-do list, cleaning to do list, shopping to do list, and baking to do list. They can help you stay on top of things during the holiday season and lessen your stress load. Who wouldn't love that? Add some trendy Christmas cheer with these free 11 x 14 Christmas prints. They each have a Christmas quote on a chalkboard style background, surrounded by a lovely modern Christmas wreath. You will love this fast and easy way to add the holiday spirit to your home decor. Very pretty! These chalkboard style prints will go with any type of home decor. Quickly print and frame these beauties for "instant" holiday ambiance. They look like you bought them in a pricey boutique! Kids will love this craft! Have them make these pretty Christmas paper napkin rings! Your children will have fun making these table decorations and will be proud of their holiday festivity contribution. This Christmas Advent tree made from printable boxes will take a bit of time to make, but it is sure to be a hit with your children. I wish I had thought of this when my kids were little! Fill each box with small treasures that your children will love! The calendar will help little ones count down to the big day. Watching the Christmas Advent tree calendar will be such an exciting event for the youngsters. Download this Christmas card printable and color with Copic markers. You now have Christmas card Dawn Nicole offers a step by step tutorial that helps you produce a professional result even if you are a novice. How great is that? This tutorial is an article that offers a lovely gift tag printable plus instructions on how to make a no-sew blanket scarf. It is a beautiful gift that is simple to make yet looks quite stunning! The beautiful blanket is so fast and super easy to create rather than making a tradition knitted or crocheted version. The recipient of this gift is sure to love it! Keep your kids busy and in the holiday spirit with these cute gingerbread finger puppets. Just print, cut and let your children's imaginations do the rest. They will be using their imaginations and playing for quite some time Fun, fun, fun! These printable recipe cards are a perfect addition to all of the baked goods you plan to give as presents. Share your holiday recipes with your friends so that they can enjoy your favorite foods after the Christmas season is over. What a practical gift your friends will surely appreciate. One can never have too many Christmas ornaments! These paper snowflakes have a touch of Scandinavian design and will look lovely on your tree or hanging in your window as decor! They will make a beautiful modern addition to your Christmas tree. Why not make a design impact and decorate your tree solely with these mod contemporary Christmas ornaments. Stunning! Decorate your presents with Santa gift tags. They are nicely designed, have some quirky Christmas humor and are much prettier than anything you could buy in a store. Save a bit of cash, show originality and give the gift recipient a laugh. Such fun!